Mention a Honda Type R and chances are your first thought will be of the iconic hot Civic, or if you’re a true Japanese petrolhead, the original spiced-up Integra. But there was another car to wear the iconic badge that hid its light under a bushel, yet at the same time was one of the greatest driver’s cars of its era. 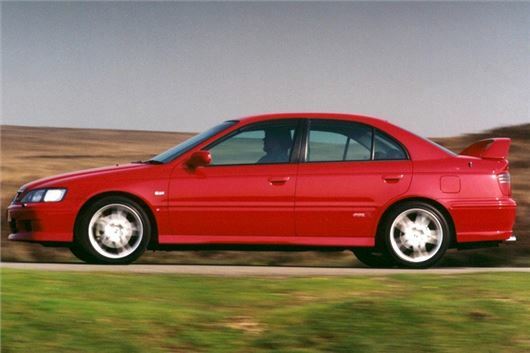 Launched in 1998, the Accord Type R was the factory variant of Honda’s first serious British Touring Car Championship entry, available in red, white or black, and bedecked with a huge rear spoiler that hinted at the potential of what was, ostensibly, a souped-up repmobile. But the Accord Type R was more than just a motorway mile-muncher in a tart’s outfit. Much, much more, in fact. The only internal clue to its potential lay in its Recaro bucket seats and Momo steering wheel. Oh, and a rev counter that red-lined at 8,000rpm. That bit was quite important. Under the bonnet, you see, was a 2.2-litre VTEC engine, with 209bhp peaking at 7,200rpm. Drive it at ‘normal’ revs and the Accord is a docile companion. Just the thing, in fact, for nipping round town or cruising up the motorway. But show it a B-road, take it into the VTEC zone and it comes alive, revving beyond levels normally imaginable and hurling itself towards the horizon. It’s 0-60 time of 7.9 seconds doesn’t really do it justice, for its when it’s on the boil that the Accord truly astounds. It’s a car with a true Jekyll and Hyde character. It has the handling to match its performance, too. A limited slip diff and razor-sharp steering mean it feels reassured through the twisty bits, while it grips tenaciously, even on slippery roads. It’s a truly rewarding car to drive, but then it’s easy to forget that the standard Accord on which it was based was a decent enough steer of its own, um, accord. As a Hidden Hero, then, the Accord Type R is a Q-car par excellence, and even better, it represents astonishing value for money. The very best examples have a strong following, unsurprisingly, and will set you back upwards of £5k, but there are still quite a few tidy and usable examples in the small ads priced between £2,000 and £3,000, and they’re tough, reliable cars, too. By a series of strange circumstances, I got to drive one of these on the Pan European launch in Baden Baden before any journos arrived. A good right up but not really done the accord type r justice. With that limited slip diff you can drive it too a track, then throw it around that track and drive it home and it won't miss a beat with that reliable h22a7 engine. It's much lighter than the standard accord too due to the removal of the split rear seat and a light recaro one fitted plus sound deadening was removed from the car. Your 0-60 time of 7.9 is so off, even honda posted a very conservative 6.7 and I have timed mine on a slight damp straight and got it too 6.1. These are rare now with only 400 on the roads, in fact there are more Sierra cosworths on the road ! With regular low cost maintenance these will be a classic very soon.